When a trend in an individual stock takes hold, then it can take on a life of its own. The momentum builds and often becomes impervious to the fluctuations, or even a change of trend, in the indices. 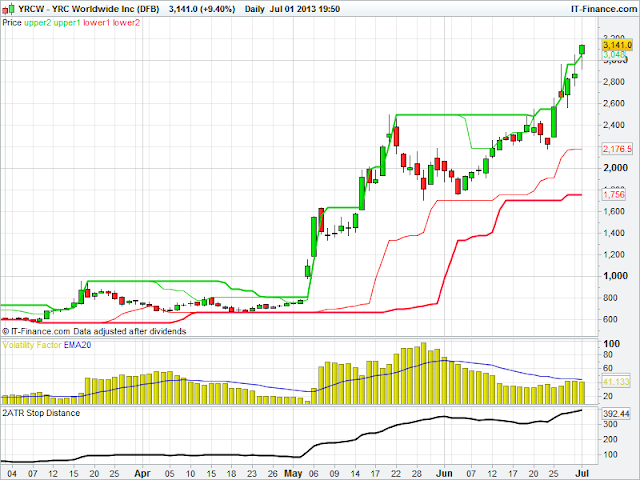 I have shown below the chart of US stock YRC Worldwide ($YRCW), which demonstrates this very well. The major indices topped out on May 22, and since then have been volatile, with a possible change of trend thrown in as well. YRCW broke out at the beginning of May and has managed to weather the market volatility, held onto its gains, and has broken out again to new highs over the last few days. Trend followers who identified the initial long signal, and have remained in their position, are again reaping the rewards for their patience. It is for this reason I recommend that, if you are currently in a profitable position, then don't close it even if the general market starts heading in the opposite direction. Keep your discipline, and wait for an exit signal in your own positions to be given.